It looks like Sonakshi Sinha is truly one 'Happy' girl. The actress, who stars in the sequel to 2016's semi-hit 'Happy Bhag Jayegi', is cooking up a fun concoction of Punjabi meets China town in a special track from the film. And guess what? She has lent her voice for the song too! China and it's various aspects play a crucial role in the sequel - Happy Phirr Bhag Jayegi. With a distinctly oriental flavour attached to the adventures of it's crazy and happy characters, the film features many Chinese elements such as it's language, culture, clothing, locales and even characters based in the country. Hence, the makers decided to look back at one of the most unforgettable Bollywood dance numbers, inspired by Chinese elements. However, that's not without adding their own fun twist. 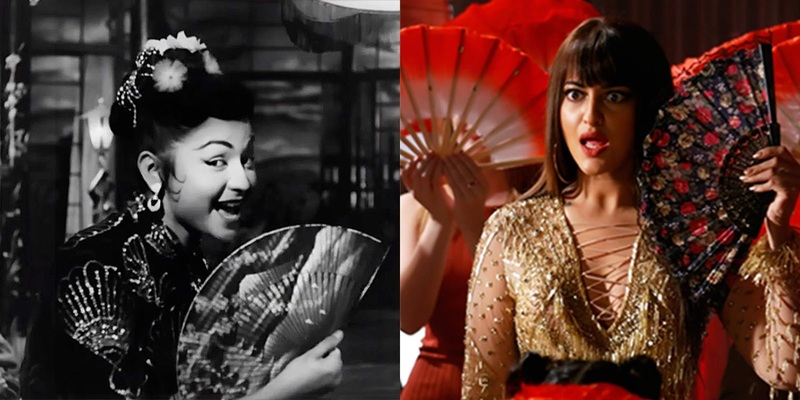 Happy Phirr Bhag Jayegi will feature the iconic ' Mera Naam Chin Chin Chu', originally shot on Helen and sung by Geeta Dutt for the 1958 hit - Howrah Bridge. The recreated version includes Punjabi lyrics and a more pumped up melody, blended together with popular lyrics from the original song. The track has been recreated by Sohail Sen, with lyrics and rap by Mudassar Aziz [who has also directed the film]. Jassie Gill and Sinha, who play lead roles in the film, have sung the male and female parts respectively. The song was launched across social media platforms earlier today. It features Sinha sporting a rather cute hairdo, dancing around a club, grooving to some crazy steps, along with other cast members - including Gill, Jimmy Sheirgill, Piyush Mishra among others. All this, while trying to save her life from some local goons! "It is indeed a privilege to dance on a song featuring Helen Aunty. She is a class apart. So, I cannot even think of copying her. All I did was enjoy myself to one of the peppiest songs from the golden era. I love how Mudassar & Sohail Sen have added Punjabi tadka to the song, thus making it a very happy go lucky track,’ stated Sinha, who plays the lead protagonist - Happy, in the film. Presented by Eros International and Aanand L Rai, A Colour Yellow Production produced by Aanand L Rai & Krishika Lulla, Happy Phirr Bhag Jayegi releases on August 24, 2018. What are your thoughts on this Punjabi meets Oriental version of 'Mera Naam Chin Chin Chu'?